This sign is for AWCO Associated Watch Company. The sign’s colors are brown, white, black, and yellow. 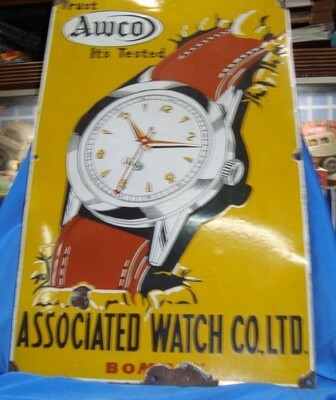 The text on the sign reads: Trust AWCO Its Tested Associated Watch Co. LTD. Bombay. The sign shows a watch in the center with text around.